What type of cookies are used by VLEX? VLEX uses session cookies, persistent cookies and local shared objects (Flash cookies). Session cookies are temporary cookies or unique identifiers associated with your browser for the duration of your visit to VLEX websites or to the customer area of the VLEX software. Once you close your browser, the identification of the session cookie will disappear and information about your visit will not be saved. Persistent cookies remain in your browser even after you close it and your browser can use them in subsequent visits to the website. Local shared objects or “Flash cookies” are cookies written with Adobe Flash technology. These cookies are stored on your computer like other cookies but can not be managed through the browser in the same way. We use remarketing cookies to communicate current content and special promotions with you through your platforms. How to change your privacy preferences and cookies in vLex? If you are a vLex user you can edit your cookie and privacy preferences whenever you want through your user account in the “Privacy and cookies” section. A window will open where you can activate or deactivate the different cookies used by VLEX. You can also choose if you want to receive commercial VLEX emails or not. You can also configure your browser to accept or reject all cookies by default or to receive a warning on the screen upon the receipt of each cookie and decide at that time whether or not to install it on your hard drive. To do this, we suggest searching the help section of your browser for information on how to change your current configurations. 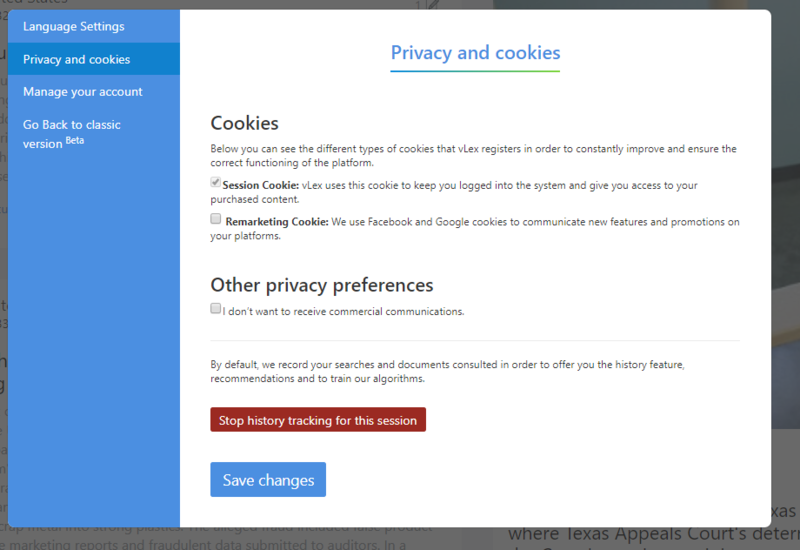 You can also use “do not track” tool to block cookie tracking. How does the extension works when I am browsing on a page with legal citations? How do I manage my documents? How do I search in vLex? Which subscriptions do I have activated? How can I keep up-to-date on document updates? How do I enable/disable vCite on a particular website?